From the mind of Bryan "Stratos" Borgman comes a 28mm (1:56 scale) tabletop skirmish game featuring humans, werewolves, scarecrows, zombies, Giant Apes, and Colossal Kaiju called Kaiju Kaos! 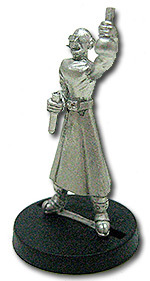 All official miniatures can be purchased from Acheson Creations and all rules and supplements can be downloaded from WargameVault.com. Please join in the discussion at our official forum (http://www.baileyrecords.com/forum) and check out our official page on Facebook. Kaiju Kaos is a 28mm-scale miniatures game. Regular-sized models are typically on a 1″ round base. Any round base smaller than 2″ (50mm) is Regular and is labeled as Size 1 on the Stat Sheet.